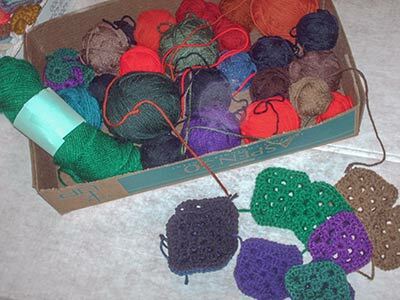 A while back I showed you the seventy-some 3-round granny squares that I crocheted from tiny “dark” scrap balls – not nearly enough for a blanket. 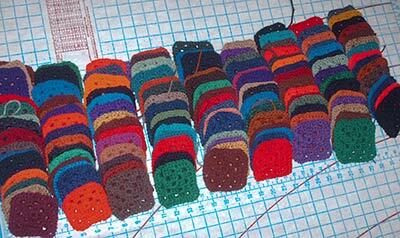 Laying them out helped me to decide what color of squares I should make next. I showed you the large scrap balls that I had already picked out. 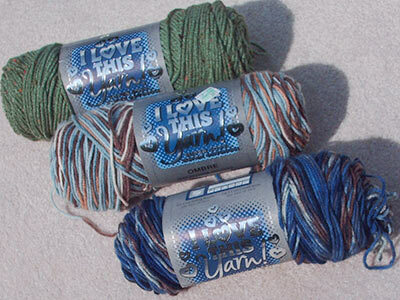 and a small skein of royal blue from Sandi of MD. enough for a kid-sized granny of 9 by 13 squares. While weaving in all the yarn ends I thought about joining methods and decided, once again, to go with the zig-zag. 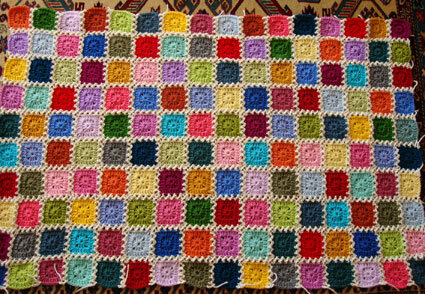 Not only does it accommodate squares of slightly different sizes, it’s fast, making it the perfect choice for a scrap blanket like this. 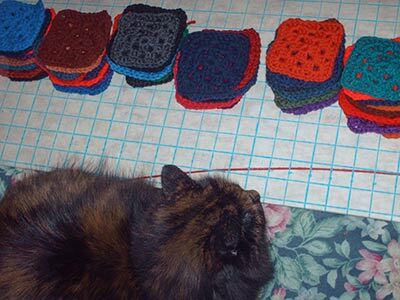 I don’t know about you but, by the time I’ve crocheted 117 three-round scrappy squares, I’m more than ready to see the things joined and bordered! lol. I’ve never done a zig-zag join in a highly contrasting color before, but it sure looks great on DoctorMomCrochet’s Tundra Scrap Afghan, so I’m willing to give it a try! Her zig-zag looks a little different from mine will because she crocheted not only into the spaces between granny clusters, like I’ve always done, but also into the center dc of each cluster – an interesting look. P.S. I’d appreciate your ideas for a more appropriate name. This entry was posted in Granny Afghans, Joining Squares and tagged Granny Afghan, yarn scraps. Bookmark the permalink. Eh, not so sure about the Ecru. 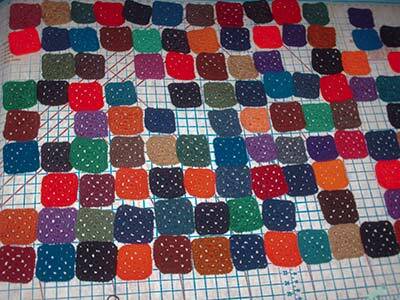 The squares colors are deep and rich, and this would be a great afghan designed for a boy. Adding a nearly white, might fem it up to much..although my actual thought is “it will look tacky.” And you don’t do tacky. But then photos and real life are often two different realities. Most boys like dark…and it hides their dirt a little better. And they get things dirty so much quicker than most girls. I say join with black…even if you have to wait for more black to find it’s way to your house. I know you want to finish one afghan per week. It just might be they get finished close together, but keep the same rate. By the way, I love your enthusiasm and energy to keep going with all you do for the kids. Ooooh, that does look nice! Way more light-colored squares than mine though, and so much Pink! – mine has no pink. Well, I certainly try not to do tacky. lol. You’re right that black would keep dirt from showing as quickly, but for there to be enough contrast between lattice and squares I’d need to eliminate all the black squares and probably the darkest navy, purple, forest and browns too! gasp. You’ll soon see. . . the ecru isn’t going to make it look girly. I would call it jewel-toned granny! Hi Bethany and Welcome to alottastitches! I really like the sound of “jewel-toned” but I think this blanket has too many tan and soft green squares for it to fit well. I’m wondering something with the word “crayons”? True and while I have blue and green, there’s no real yellow, only gold. Very pretty! I’ll keep it in mind for a future granny. I have a simple, rather masculine, border in mind. At first I liked Jelly Beans. . . but then I wondered about the Royal Blue and Teal squares. Turns out there are lots of blue jelly beans – should have known! lol – but I’m still not sure. How do you feel about Crayons? When I read crayons, I thought, yeah…perhaps specifically Dark Crayons or Autumn Crayons. I like the Autumn part. On another tangent, “Cozy Colors”? I love it – but I think I agree with Ann B that the off white MAY make it more feminine?? Since you don’t like the black as it would eliminate some squares – how about a light to medium gray?? I had a girl in our crochet group do one with a gray border and it was gorgeous!! Just a thought…….. Either way – I’m sure it will be lovely and well used by whichever child receives it!! I’ve started joining with the ecru. IMHO it looks really GOOD! I’m intrigued by the idea of a granny joined with gray though. 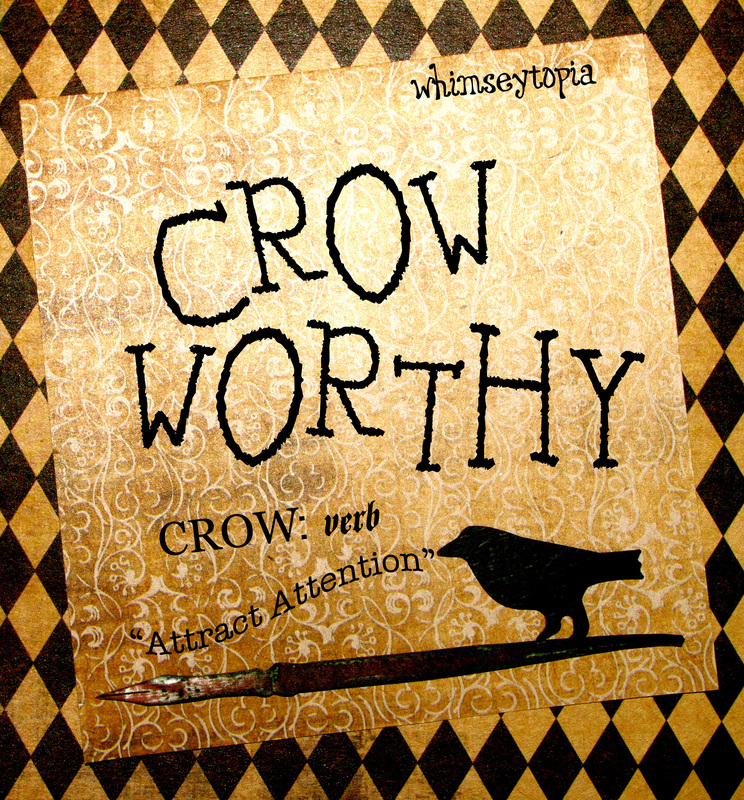 . . very uncommon. Would love to have seen your friend’s! Honestly, I prefer the sound of “Cozy Colors”. But “Marbles” would be perfect for one of those granny squares that have a circle in the middle. If the circles were done in variegated yarns they’d really look like marbles! That sounds like a fun project! I don’t work with variegated very often, but I’m going to tuck this idea away for a possible future project. I like the ecru and Cozy Colors. At first, the colors brought jewel tones to mind, but that’s not very guy-ish at all, is it? They are definitely cozy, though! I actually made a few “marble” granny squares about a year ago using a less-holey pattern, but I had such a problem with them curling that I set it aside. 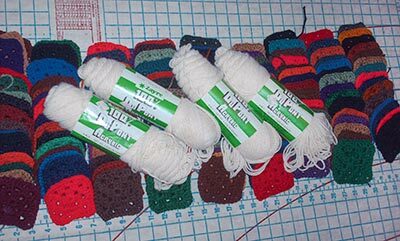 I want to try again using the pattern I linked cuz it would be so easy to add an extra chain between granny clusters, if necessary, to get them to lay flat.